John Tweddle is one of those artists who never really fitted into any scene he found himself in. The astonishing, eccentric body of work that he has produced during his lifetime may be both the cause and effect of this condition. Born in 1938, he left rural Kentucky to go to art school in Kansas City and Atlanta, then moved to New York at the end of the 1960s. A decade later, appalled by the commercial art world, he turned his back on the city and moved back South. Today he lives and works in Santa Fe, New Mexico, which seems about right for an artist of his bent. This exhibition of Tweddle’s intense paintings and drawings, guest curated by fellow Kentuckian Alanna Heiss, focuses on work Tweddle made between 1969 and 1971 – just after he arrived in Manhattan. His folkish sensitivities were already being affronted by the venality of the New York art market, which was then consumed by the war between Abstract Expressionism and Pop – both movements that influenced his work. In these paintings, a struggle plays itself out on the surface of the canvas. The term schizophrenic is ill- and overused, so let’s call them internally conflicted. On the one hand, they are ecstatic, devotional objects that seem to aspire to the highest orders of human value. The majority of paintings consist of a central image or motif surrounded by layer upon layer of decorated borders. They nod to the folk woodcarving genre of Tramp Art, and to the aesthetics of quilting and Navajo tapestry. Every canvas but one is stretched over a form with gently scalloped edges, reinforcing their association with objects such as rugs or blankets. At the same time, Tweddle presents his paintings as desecrated, ironical statements declaring their own corruption. Sold (1969) is a case in point: a central image of a ploughed field has been defaced with powder blue slashes. ‘SOLD’ reads Tweddle’s inscription over the horizon. 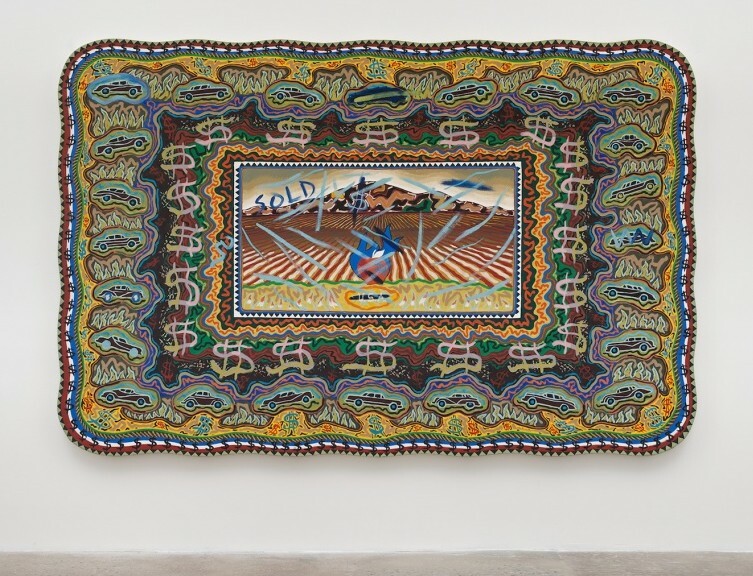 Dollar signs (which feature in almost every painting) ring the inner picture, over and around the writhing patterns that constitute Tweddle’s elaborate borders. While the painting is interpretable as a protest of the desecration of the American landscape, other works such as Art World (1971) and Art (truck) (undated) make it clear that Tweddle’s overriding concern at the time was the commodity status of his artworks themselves. These paintings are conflicted because one does not get the sense – not for one moment – that Tweddle considers his paintings worthless or undeserving of a purchaser’s covetousness. (As it happens, this entire exhibition is drawn from the collection of Robert Scull, one of Tweddle’s most devoted patrons.) 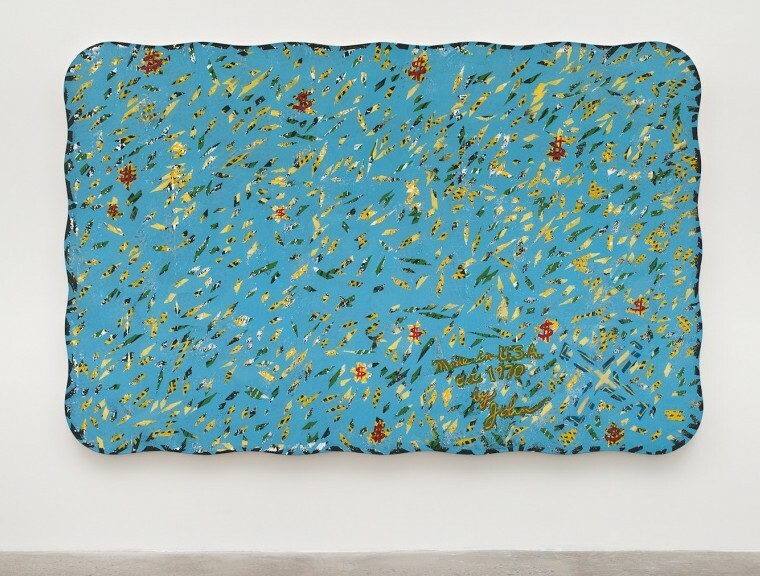 In one of the most captivating works, Tweddle has painted an abstract composition with red dollar signs arrayed across it; then, perhaps in a change of heart, he applied torn strips of masking tape and rollered the entire canvas with sky blue acrylic. Where he removed the tape, the original image peeks through the blue. There is no sense that Tweddle is disavowing the painting, however; an inscription, which is also the work’s title, was carefully masked off: ‘Made in U.S.A. Oct 1970 by John’.